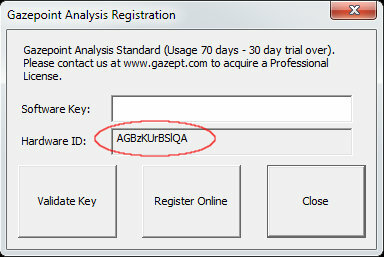 Gazepoint Analysis UX Edition is provided as a free 30 day trial for all customers. If a software key is not entered, the software will revert to Standard Edition after 30 days. 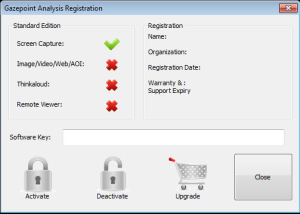 If you have purchased Gazepoint Analysis UX or Professional Edition, please complete the following steps to obtain your software key. If you would like to learn more about the benefits of the Gazepoint UX or Professional Edition, click here. Step 1. Submit the registration form and wait for your software license key to be sent by email. Allow 1 business day for processing. Note: The software is registered to the computer. If you need to change or upgrade your hardware, you will need to Deactivate the software on the old computer before you can re-use the software key. Contact us for further help info@gazept.com. Step 4. 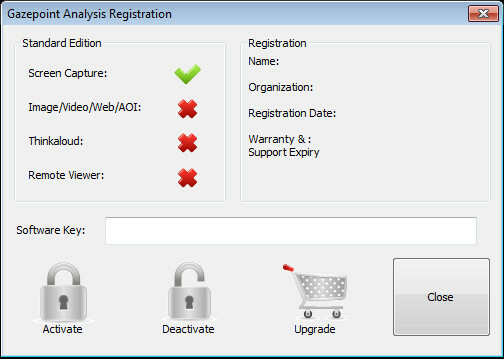 Paste the Hardware ID in the form below along with other required information and click send. We are usually able to send keys within 1 business day. Note: The software is registered to the computer. If you need to change or upgrade your hardware, you will need to uninstall the software on the old computer and contact us info@gazept.com for a new software key.